You may not always have cell service or hookups when you’re camping in the woods, but you will get peace, quiet, and cool shade from a canopy of trees. 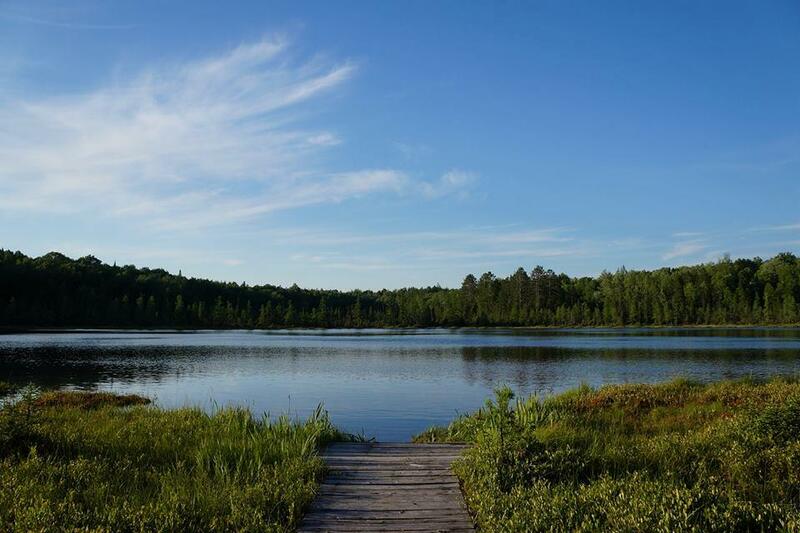 Forest campgrounds are also usually a short walk from hiking trails and rivers or lakes where you can go fishing, swimming, or kayaking/canoeing. These are some of our favorite campgrounds in the woods that have nicely shaded sites for tents and RVs. Laura Lake is surrounded by the Chequamegon-Nicolet National Forest in northeast Wisconsin. The campground has rustic back-in sites along the lake and is just a short walk from Lake Gordon where there’s a picnic area and swimming beach. You can go fishing, kayaking or canoeing out on the lake, or hike a trail that goes around the shore. The sites are private and well-spaced, each with a picnic ring and fire pit. They’ll be open from May 3 through October 22. More info. Denny Creek Campground is an easy stop off I-90 in Washington’s Mount Baker-Snoqualmie National Forest. The sites are spaced out among tall shady trees and some have electric hookups. A few trails start from the campground and several more (like Snow Lake) are only a short drive from the sites. We recommend taking the Franklin Falls Trail from the campground for a two-mile hike (with only 400 feet in elevation gain) to a gorgeous waterfall. You can walk up close to feel the mist from the final 70-foot drop of this waterfall, just be careful of the slippery rocks. The campground is open seasonally from May 10 through September 30. 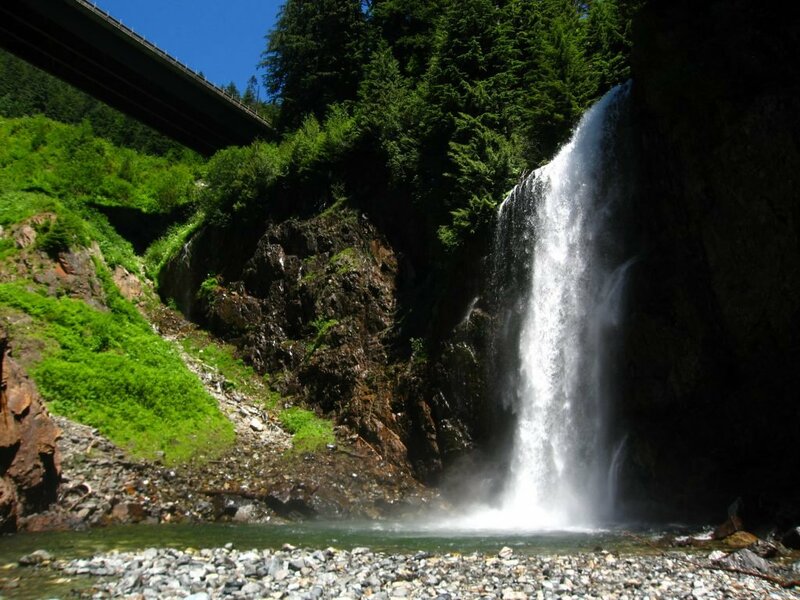 While you’re in the area, make the half-hour drive west to the iconic Snoqualmie Falls. More info. Heart O’ The Hills can be found on your way up Hurricane Ridge in Washington’s Olympic National Park. You can park the RV or trailer at this campground among old-growth trees and take your tow vehicle the rest of the way up the narrow winding road. The campground is open year-round (weather permitting) and sites are $20/night, first-come, first-served. The campground has sites for RVs up to 21 feet in length and a few up to 35 feet. Like many forest campgrounds, there are no hookups and many of the sites are not level. However, from the top of Hurricane Ridge, you can get unparalleled views of the Olympic Mountains, check out the Visitor Center, and access several hiking trails. More info. 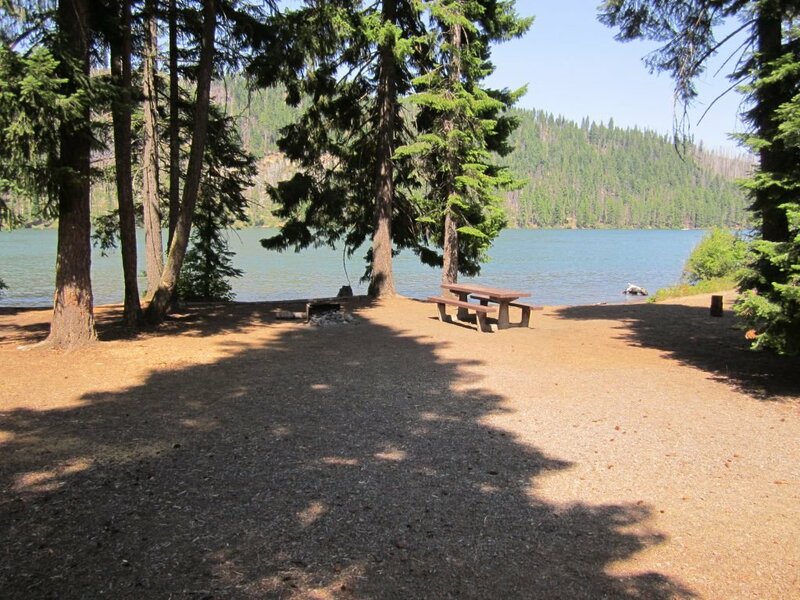 This campground is along the south shore of Suttle Lake in Oregon’s Deschutes National Forest. The sites are nicely shaded by the tall surrounding pine and Douglas fir trees. About a third of the sites are located right on the lake and the rest are on a hillside overlooking the water. Each spot has gravel parking, a picnic table, and fire ring, and dump stations are located across the campground. The lake has a boat ramp and a 3.2-mile trail that follows around the shore. South Shore Campground is pet-friendly and open seasonally, from March 16 through October 6. More info. Mount Rogers Scenic Byway takes you through beautiful countryside in southwest Virginia and passes a recreation area in Jefferson National Forest. This area has a family-friendly campground, playground, sandy beach, and picnic shelters, as well as a fishing pier where anglers can catch smallmouth bass and rainbow trout. The sites have no hookups, but can easily accommodate most RVs. They’re surrounded by dense trees, and each one is equipped with a grill and picnic table. Near the sites, you can swim or rent a canoe to take out on the lake. There’s also a scenic hiking trail that follows around the shore. The campground is seasonal and will be open from April 28 through October 28. More info. Only 16 miles east of Yellowstone, Newton Creek Campground is a less crowded place to camp near the Shoshone River. The campground is just off Highway 16 in Shoshone National Forest of northwest Wyoming. Because it’s in the heart of grizzly country, the campground only allows hard-sided RVs (no pop-up campers or tents). Sites are only $15 a night (no hookups) with a 16-day limit and potable water available. The campground will be open May 18 through September 23. More info. Don’t be deterred by the steep gravel road to this campground. The drive is well worth it to reach a quiet, less visited location in Roosevelt National Forest of northern Colorado. The campsites are set among a ponderosa pine forest with colorful wildflowers in the summer and many nearby hiking trails for all skill levels. It’s also the only campground in the area with big rig friendly sites and 30-amp electric hookups. 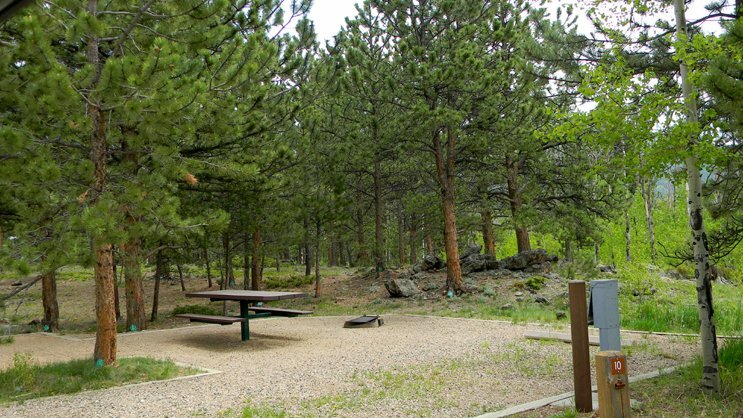 Jacks Gulch Campground will be open from May 24 through November 4. More info. Shoreline Campground is across the road from Warm Lake in Idaho’s Boise National Forest. The campground is at an elevation of 5,300 feet and gets partial shade from the surrounding trees. There are no hookups, but each site has a picnic table, fire ring, and grill. A boat ramp is just across the road from the campground, and a small sandy swimming beach is a short walk away. The lake is also popular among anglers for catching cutthroat and rainbow trout. If you prefer going off-road, take your ATV on a twenty-mile drive along Telephone Ridge Trail #112. The campground will be open from May 24 through September 13. More info. campground even deeper in the wilderness. The Adirondack Park area features millions of acres of wilderness with hundreds of lakes……a real camper’s dream !!! Love the Adirondacks! Try Brown Tract Pond just out of Rackette Lake.